Friday March 19th 1897 It was as warm as summer. I was at work all the forenoon with sweeping and putting some things to rights. I went over and read to Aunty in the afternoon and Will went to a [ride?]. Saturday March 20th 1897 The weather was so much better that I went to town over the river to dinner. [Nate?] came back to town with me. Did the evening work and fixed Aunty's [illegible] that I bought today for her. Father Duncan is dead Sunday March 21st 1897 I was busy [illegible] the wash ready all forenoon Went over to Aunty's after dinner and took her [illegible] to her. read in the afternoon and evening. 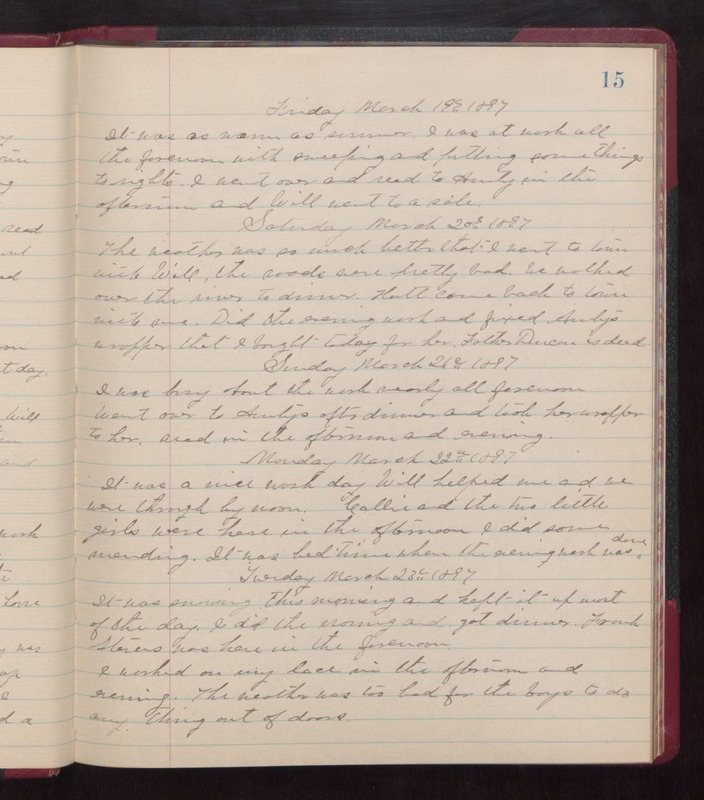 Monday March 22nd 1897 It was a nice wash day Will helped me and we were through by noon. [Callie?] and the two little girls were here in the afternoon I did some mending. It was bed time when the evening wash was done Tuesday March 23rd 1897 It was snowing this morning and [left?] it up most of the day. I did the [illegible] and got dinner. Frank [Stevens?] was her in the forenoon. I worked on my lace in the afternoon and evening. The weather was too bad for the boys to do any thing out of doors.